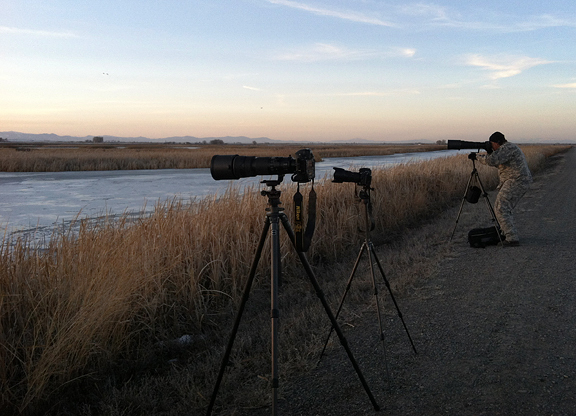 I went on my annual sandhill crane migration shoot in southern Colorado earlier this week with my shooting partner, Jason. We crammed driving to and from Monte Vista, four shoots, a half day at Wolf Creek (ski resort), and not a lot of sleep into 48 hours. 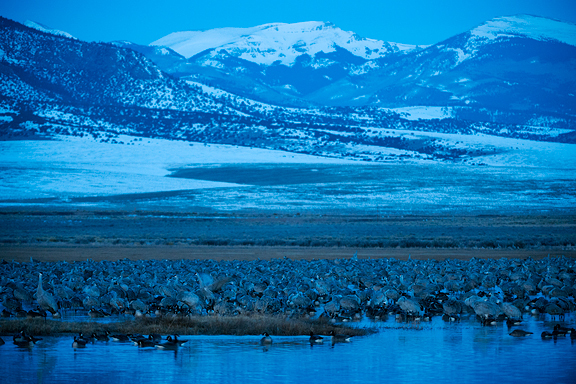 The town of Monte Vista, Colorado holds their Crane Festival this weekend (March 9-11). 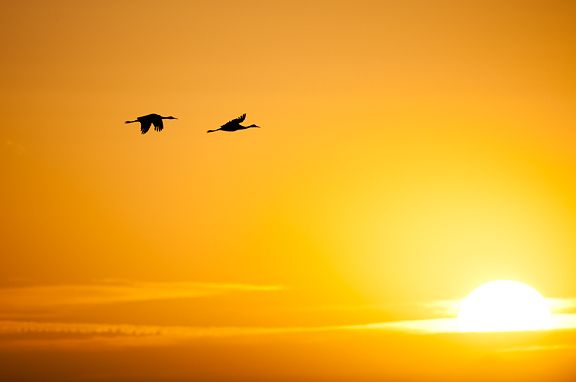 A big shout out and thank you to Pro Photo Rental for supplying us with the 200-400mm Nikkor f4 and the 500mm Nikkor f4 on this trip. You can see the entire set on my photoblog. Lack of sleep combined with standing around in the dark and cold at 5 am probably resulted in the cold I came down with Wednesday evening. That made sifting through my 2,687 photos a lot of fun. But I’m on the mend now and it’s back to the business at hand. Let’s talk doughnuts. Specifically – French crullers. French crullers are my favorite doughnuts. They are eggy and light, made from pâte à choux – a sort of fried version of the cream puff. These are the ones I always search for if we ever happen upon a doughnut shop. Jeremy goes for the chocolate-filled, drenched-in-chocolate, chocolate something or other, but I am perfectly happy with a delicate, simple French cruller. I found a recipe for French crullers in Lara Ferroni’s Doughnuts book. Crullers always seemed like they would be complicated and involved, but this recipe is pretty straightforward and quick. That’s dangerous. Very dangerous. 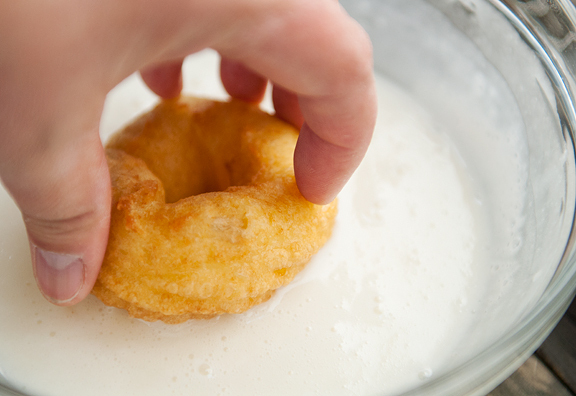 When piping the batter in rings, don’t be tempted to overlap the ends too much. I did that and it makes for a lopsided cruller. Just pipe to complete the ring and twist the piping tip up. And if you don’t care what your crullers look like, then do whatever you like – because it all turns out delicious in the end. Lara’s recipe says that you can bake crullers just as easily as you can fry them, they just come out with a slightly harder exterior shell. Since I was going to the trouble of frying them, I fried them all. The recipe instructions say to place the ring of dough into the hot oil and then remove the parchment. Mine seemed to stick, so I left the paper on for a minute or so before gently prying it off (using tongs) with the help of a knife to keep the dough on the doughnut and not the paper. Lara also warns that undercooked crullers will deflate when they cool, so be sure to have a sacrificial doughnut to test for doneness. 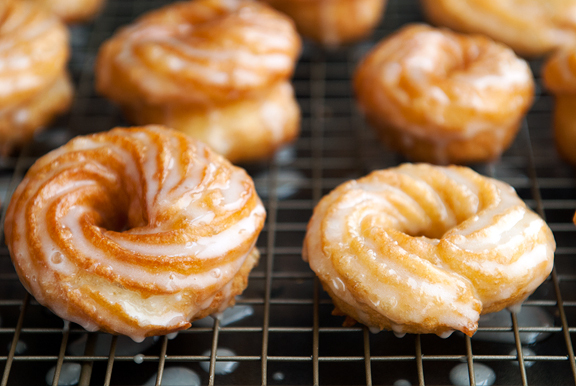 While the crullers are cooling, you can whip up the honey glaze in about a minute. Dip the pretty side down into the glaze about half-way, then set the crullers on a cooling rack to let the glaze drip off. This might be a good time for some quality control, so definitely bite into one to ensure you don’t have a batch of duds. Go ahead, no one is watching… except for the dog. 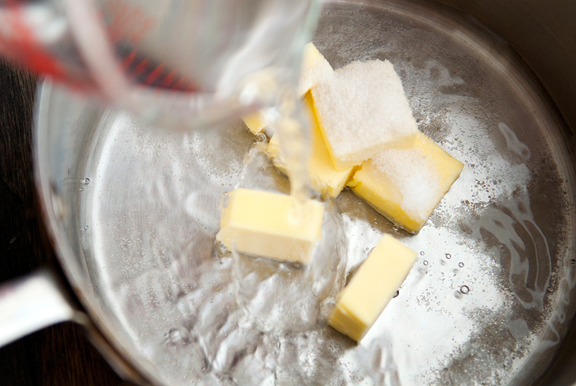 Bring the water, butter, sugar, and salt to a brisk boil in a heavy-bottomed saucepan. Stir in the flour all at once and continue stirring until the flour is completely incorporate. Keep stirring over medium-high heat. Lara says the more moisture you can remove, the more eggs you can mix in later which will result in a lighter pastry. 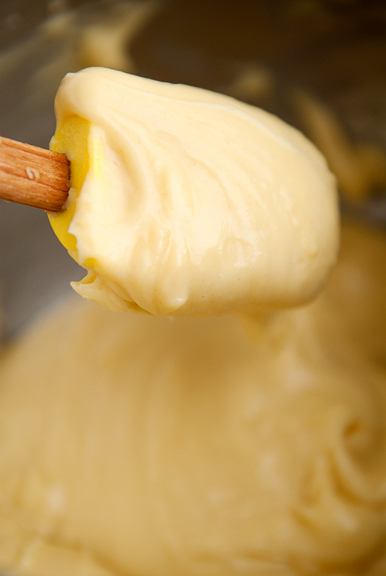 When you see a thin film start to coat the bottom of the pan, the batter is ready. 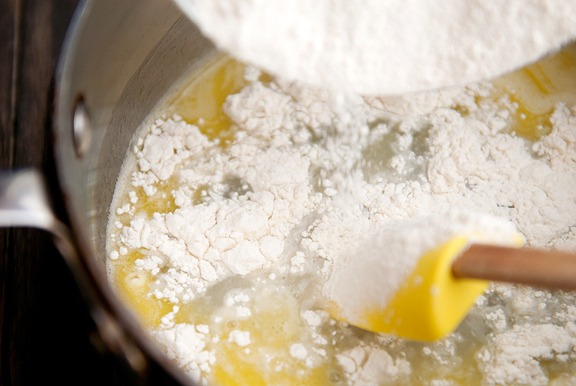 Transfer the dough to the bowl of a stand mixer. Use the paddle attachment to stir the dough for a minute to help it cool. 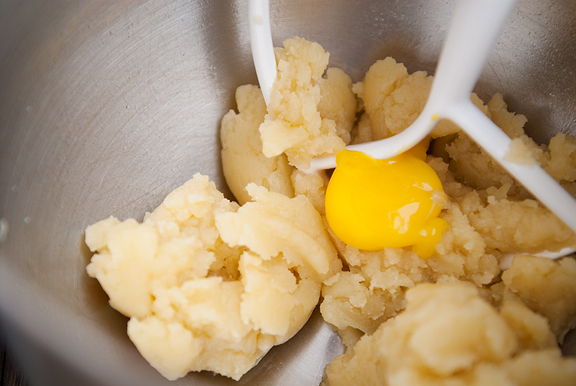 Turn the mixer to medium speed and add one egg. 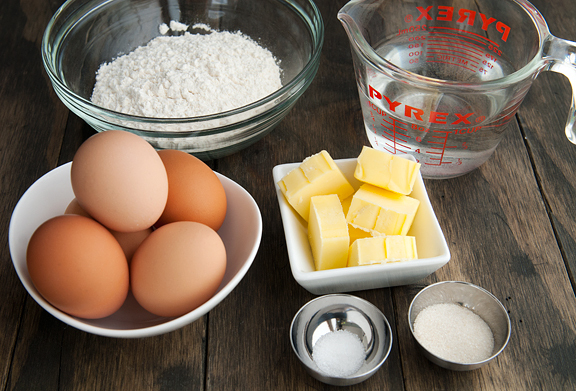 Don’t add the next egg until the previous has been completely incorporated into the dough. Then add the egg whites a little bit at a time (I used two egg whites) until the dough becomes smooth and glossy and holds a little shape (not much). Lara warns not to add too much egg white or else the crullers will become heavy. Transfer the dough to a large pastry bag fitted with a 1/2-inch star tip. 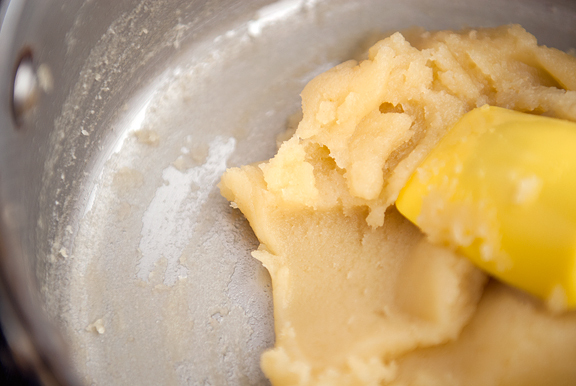 Fry the crullers in 2-inches (or more) of vegetable oil in a heavy-bottomed saucepan. The oil should register 370°F. 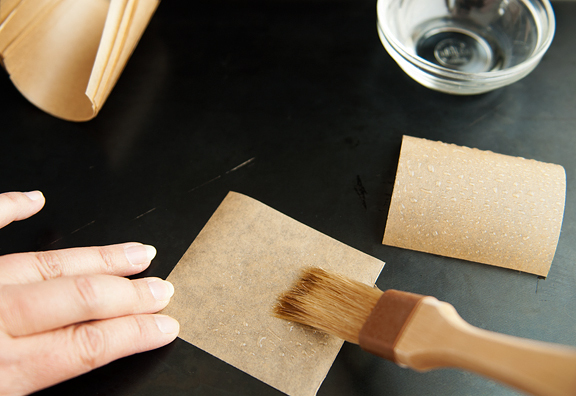 While the oil is heating, cut a dozen 3-x3-inch squares of parchment. Lightly grease the squares on one side (I brushed with vegetable oil) and pipe a ring of dough onto each of the squares. 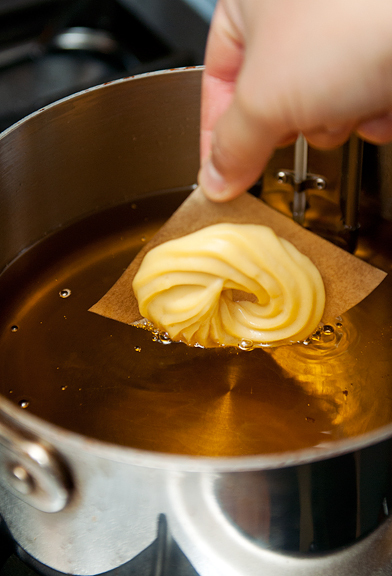 When the oil has reached temperature, carefully place a cruller, paper-side up, into the hot oil. Do this one at a time unless you like the idea of hot oil burns and other disasters. 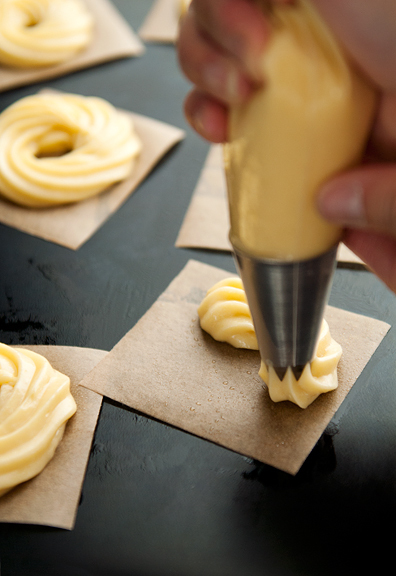 After a minute or so, I would use tongs and a sharp knife tip to gently peel the parchment off the cruller. When the cruller turns golden (about 2 minutes), flip it over and let it fry for another couple of minutes before removing it to drain on a cooling rack or paper towels. 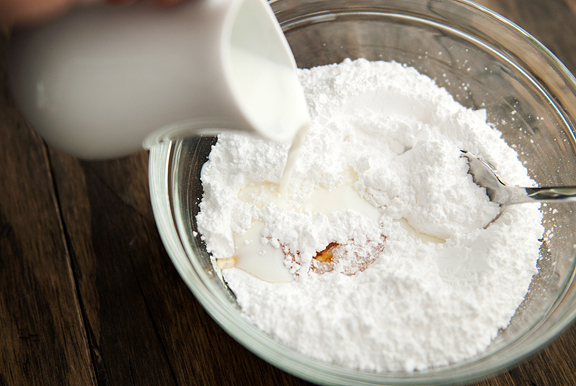 Make the glaze: While the crullers cool, mix the confectioners’ sugar, honey, and milk together until smooth. 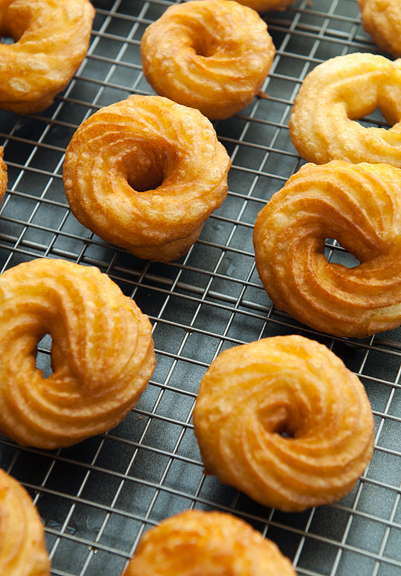 When the crullers are cool to the touch, dip the top of each cruller into the honey glaze and set on a cooling rack to let the drips run off. When the glaze has set, the crullers are ready to serve. Crullers can also be baked. Preheat oven to 450°F. Pipe crullers onto a parchment-lined baking sheet at least 2-inches apart. Bake for five minutes then reduce oven to 350°F and bake another 15 minutes. Turn off heat, open the oven door a crack, and let crullers sit for 5 to 10 minutes. Glaze and serve. Makes 10-14 (I made 12). These look wonderful! I had no idea they would be this easy! Mmm. My nephew is on Spring Break next week, and I think I just found our Tuesday morning project! You just made my day by posting these! These are my all time favorite donut and until now, were always on my “buy only” list. Amazing! bring those down the hill and shove them into my mouth. please. I’ve made these before- several times, in fact- but never did the piping-into-a-ring before; I used the simplest method of just using two spoons (like rustic dumplings), and then dusted them with powdered sugar. You make the elegance above look so easy- must try! Even though I suspected it, I’m glad to know I’m not the only one that doesn’t sift! 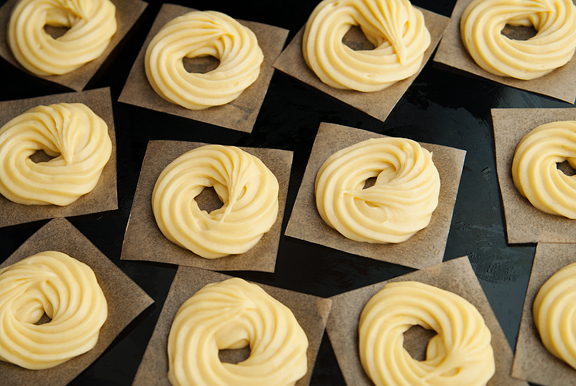 I love this method of preparing the crullers and the use of the baking paper to drop them into the oil. Genius! These look delish!! I really want to try them!! They look so delicious and you make this look easy! Wow, I’ve fried cider doughnuts before, but never a cruller. Yes please. Thank you sooo much for publishing this (and with photo steps too). I grew up eating crullers. They were my fave! When I married my husband he took on the weekend “donut run”. I would always ask for a cruller, and he would bring me a cake donut. When I finally found a picture of one to show him, he said the donut shop didn’t have those. I was horrified. Sure enough, NONE of the donut shops around us make crullers. The horror! Now, I can make my own. I am so happy. Thank you!! Wow, I didn’t know making french crullers was actually doable! Thanks for the step-by-step photos – makes this process a lot easier, especially for a first-timer! Oh wow…I resisted your last doughnut post, but may not be able to resist this one. They look so good! Oh my goodness. These look AMAZING! They are a little more work, aren’t they? But really not too bad. Saving this one to try on a rainy day!! I so am not going to read the recipe. I do not need to know how to make these at home. If I learn how it could be very, very bad. That being said, they look awesome! Crullers are my favorite doughnut too. I will have to try these. Oh my how I love cruellers. These sound like something I could do. Thanks for sharing. This looks so yummy! Found you via Pinterest & had to visit. Do you know what size the pastry bag tip is ? Looks bigger than what I have, but still want to give this recipe a go. I want to try and bake these. What temp should I set the oven at, and how long do I bake them? Thanks! Wow. Those crullers almost distracted me from the beautiful photos of the cranes. I must make these soon. Oh my word. I love crullers. Also, your photographs are gorgeous! Amazing!!! These are close to the top of my ‘next recipe to try’ list. MMMMmmmm these came out really good. Perfect for a foggy Sunday morning here in Los Angeles. As I didnt want the mess, I decided to bake these. They came out delicious, but not as tasty as frying. Tried them, both fried and in the oven. And though in the oven is much healthier, I do prefer them fried. Oh dear! this is EVIL! I LOVE crullers! No one makes them right anymore. Guess I’ll have to make them myself~ Thank you! Krispy Kreme claims crullers but those appear and taste like their donuts. Dunkin Donuts had the best but they’re gone from this area. Thanks for the recipe. Now I can make my own. I love the airy crullers! Oh my, these are simply beautiful. I think I can taste them from here. Oooh, these look so good. Crullers were my favorites as a kid growing up. I’d like to try baking these – I’ll save the frying for the doughnut shops :) Beautiful! My goodness these look amazing!! Oh my goodness! These look heavenly! I started the tradition of making doughnuts every Easter morning and these look amazing! Heidi – they aren’t that bad except for the frying (which isn’t that awful either, just a mess to clean up). Good luck! Jamie – that’s so funny! I sometimes have a hard time finding them too, although it’s always been on my list to learn to make them. Hope you enjoy! Kristin – I think this doughnut recipe is much easier than that other one. peabody – You could totally make these with sprinkles on top! Amy – the recipe says a 1/2-inch star tip. So it should be 1/2-inch across the tip (I measured it). 1916home – Thanks! I may try baking next time, so it’s good to know they worked out. Nathalie – :) hee hee! Made these last night and they are delicious. FYI my oven opens too much for “a crack” and some of the crullers sunk (still tastes good). I wedged a wooden spoon in door and next batch came our great! Beautiful photos and the doughnuts!! They remind me of those we use to have on Fat Thursday school’s parties back home. I would love to feature this as Article of The Week (just a thumb and link to your post) if you don’t mind? Jen I love your site, thanks for this recipe. I just tried them this morning and they were delish, but they fell a bit when cooling. Do you know what contributes to that? Lucy – I mentioned in the post that Lara said the crullers will tend to deflate if undercooked. So I think that’s your culprit. I am all about this post!! 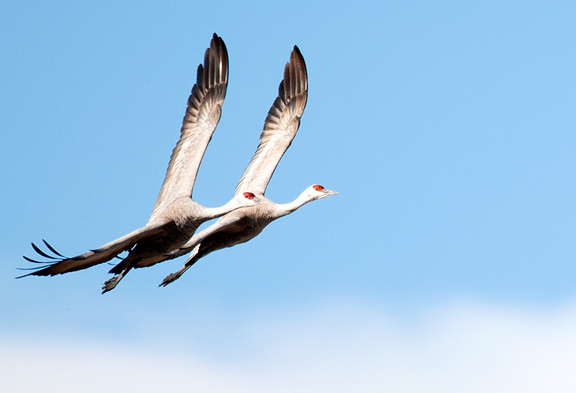 Sandhill Cranes used to fly over my house every year!! (We lived in SE NM) One day, I remember going outside and one had landed on top of the electric pole in the alley behind my house. I will never forget! The other thing, crullers! I love crullers and will try this recipe!! Thanks for two wonderful things in one fabulous post. Anyways, thanks for sharing this recipe! Next time, I’ll try frying them. Just finished making these. Delish! Thanks! OMG! I have been searching for a recipe for French Crullers for so long I lost track. When I lived in NY I got these all the time and I could never stop at one. They are the best donuts, if made correctly, you will ever eat. I haven’t actually tried this recipe yet, but the finished product looks exactly like what I am looking for. The best French Cruller I have ever had is at Country Donuts in Crystal Lake, IL. They are so moist and melt in your mouth. I have been looking for a recipe that would resemble those. this is it! I made them this morning and they were delicious! The only thing is it had a little more of an egg flavor than I would like. I wonder if I could use one less egg or maybe didn’t mix it well enough although I followed the directions exactly. Thanks for posting! bonita19 – you could try reducing the egg and see if it tastes better to you. Although, perhaps incorporate some extra egg white so it’s not too thick? I just made these! Here’s my blog post about them! They were so yummy. I saw a thing on TV about cutting them open and stuffing them with fresh fruit, so I did that! Thanks for the great recipe!! Your blog is great. French Crullers have always been my favorite donut!! My favorite are the chocolate glazed, though occasionally I pick a maple one up. Finding that my friend had posted this on facebook made my night!!! Looks simple enough to make. Curious if you have a recipe for the chocolate glaze, as well as the maple. For a little over six years years now, I have been on a gluten-free diet. These donuts are one of the few things that I miss eating. 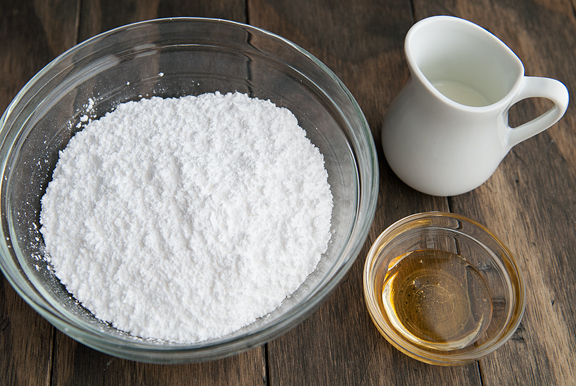 I make a gluten-free flour mixture that I use for baking. Hopefully it won’t fail me with this recipe!! No need to sift it as it is naturally delicate and light in texture!!! Thank you again!!!! Looks so easy and extremely delish! Thank you for this wonderful recipe! I loved how these turned out – so much so I wrote about them on my blog! I don’t have a piping bag so I just used two spoons and dropped them in. They are addictively good. Thank you!!!! Thank you! French Crullers are my favorite doughnut, and they turned out great! I figured something would go wrong, but to my surprise they were super simple and so delicious! I adore crisp, eggy, crullers. These look amazing. I saw this on Pinterest and I’m so glad that I stopped over, cuz I can’t wait to try this recipe! OMG OMG OMG Thank you so much for this recipe!! These are my ALLTIME FAVORITE DONUT IN THE WHOLE WORLD!! THE BEST donut shop that makes these is JOLLY PIRATE DONUTS in Huntington, WV. All of their donuts are extraordinary, but the French Crueller’s are so light, fluffy, and delicious. They look very similar to your photo. . which gets me super excited. . .seeing as how you’ve made it look so easy!!!! Julia – please refer to the recipe, you’ll find the instructions for baking there. I like to take Saturday mornings to do more complicated breakfast recipes. This one was today’s and it was my favorite yet! Frying generally intimidates me, as does pastry, so I was so pleased these actually turned out the way they were supposed to! The glaze is perfectly sweet–and they’re just so dang pretty! So glad I stumbled across your post and thanks for inspiring me to conquer my kitchen fears! do i need 5 eggs all together?, 3 eggs plus 1 or 2 egg whites? Blaise – um, no. This is the standard way whole eggs and partial eggs (yolks or whites) are listed in recipes. And this is how the recipe is listed in the book from which it came which was vetted by a cookbook editor/publisher. If you do much baking of pastries, you’ll see this is the typical method for writing out ingredients. YUM! I just made banana pudding donuts for my blog and was curious to how to get the french cruller texture. My question had been answered! Thanks for sharing. 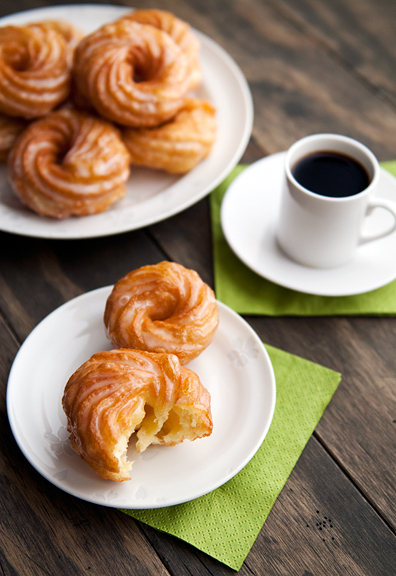 French crullers has been the ones that I have love for 50 years. It is getting harder and harder to fine a real French cruller. Thank you so very much for this. I will now make them myself. These look amazing! Definately on my to make list! Thank you Open Hands to sharing this! Hello.. they really look amazing! i just wonder if we can bake it instead? thanks..
Haslina – I think you can try baking them. They won’t be as good as fried, but it will likely be similar to something like cream puff dough when baked. These are incredible! And don’t bother baking them. I did both and there is something about deep fried dough….. The first time I made yeast donuts was the day Lee Harvey Oswald was shot! I was 12, and trying to duplicate the amazing taste of homemade donuts sent over by a family friend. I have been trying ever since, to no avail. Whole these are not yeast donuts, they inspired the same taste memory. how should these be stored and how long will the stay fresh? carole – i think you would store them as with any fried doughnuts – in a paper bag or waxed paper bag or box? But really, they are best eaten the day of and probably not more than a day after. AS a diabetic I will forgo the glaze but will make the glaze for the rest of my family. Thank you love crullers and could not eat them because of the glaze now I can make them and home and of course control the portion I eat since they are small thank you thank you. Thank you for sharing! This looks delicious, we want to share the recipe (with creds) on our FB https://www.facebook.com/ChasseurAUNZ and Instagram @chasseur_cookware group. If you’d rather we don’t let us know and we will remove it. Can’t wait to try it. I just made these. Super Delicious. Instead of a honey glaze, I had some raspberries laying around and use those for my glaze. Really good. Next time I would cook my choux a little longer so they aren’t as moist inside, but all around it was A+. Thanks for sharing! 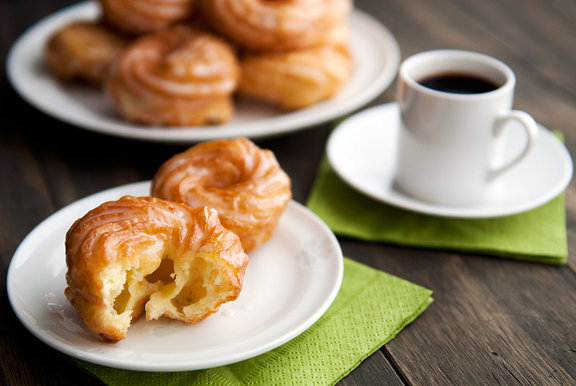 French crullers are my all time favorite doughnut and this recipe is fantastic. I am so glad they can be baked, because I try not to eat fried foods. Thank you so much for sharing this recipe. I was recently hunting for a cruller recipe because I am thinking waffles from crullerbdough would be amazing. Have you tried this? emily – never tried that before, sounds good! Is your star tip open or closed? Also could a size 7 tip be used or would the donut be too big? Anxious to try this …..
Bobby – open. I’m not sure what a size 7 tip is, but I think the only danger of using a larger tip is if you don’t make the circle wider, then the “hole” might close up during frying. My cousin sent me the link for this recipe, it looks fantastic! I’ll definitely be trying it out soon! I’ve been experimenting with cruller for awhile. Butter is a must. I did have the problem of the crullers being hard to remove from the wax paper, so I solve the problem by sticking them in the freezer for a few minutes. Once they cooled they keep their shape and are easy to remove. My problem is they get soggy if not eaten right away.and I haven’t worked that out yet. Also I’m using a half inch tip but the ones you buy seem to be bigger and airier. Anyone have answers for those problems?